Press Seal Bags, also known as zip lock bags, are clear, low-density plastic bags with a plastic press seal strip. Peak Packaging Press Seal Bags are reusable, which makes them great for storing items that need to be accessed repeatedly. Peak Packaging Press Seal Bags contain a high-quality press seal to ensure that secure storage, making them handy for storing a large quantity of small items, such as screws and bolts. 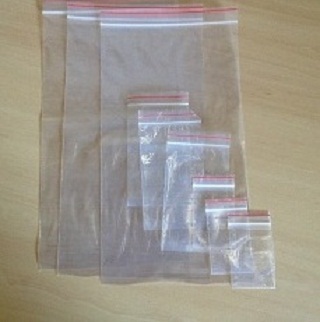 Our Press Seal Bags are made using a durable, long-lasting plastic, which means you can use them over and over again. Peak Packaging Press Seal Bags can be used to store and easily access a variety of items, such as spare parts, instruction manuals, hardware, money, etc. Peak Packaging Press Seal Bags can also offer convenient presentation for a wide range of commercial products. Our Press Seal Bags offer easy visibility as they are made of clear, low-density plastic. This makes them the perfect storage bag for professional display. In order to offer all Peak Packaging customers a superior product to suit a range of needs, our Press Seal Bags are manufactured using the highest quality materials.